Franz Mueller is the owner of The Rucksack which is located in Kaiserslautern, Germany. So, when I left Kaiserslautern, it was my full intention to drive into the alps. 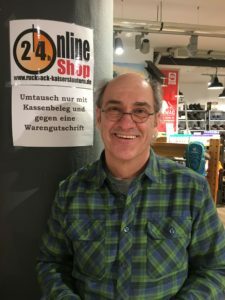 I had spoken with Franz, the owner of Rucksack-Kaiserslautern. I had gone to get some more gas for my stove, and he gave me some suggestions of good camping spots in France and in Switzerland. He even drew me a map. I was equally intrigued by Franz’s new business venture. He’s started a company called Monkey Hardware. The premise is to use install rocks for climbing into trees. It gives people the ability to climb even if they don’t have a rock wall nearby. I told him that I thought my daughter would just love that. I tried to go to the dmv in Kaiserslautern on Wednesday, but they had closed at 12. After I rented my car on Thursday morning, I headed back and tried to secure an international license. Apparently, they are bit more strict in France and Switzerland about that license. In Germany, you can just use your US license for a short period. While the German dmv issues licenses to military members and their families all of the time, they don’t to random civilians who wander in. I decided that I would just start heading south down the autobahn and figure it out as I go. Now, I’ve always wanted to drive on the autobahn. It’s like any other highway in the US, but, in certain sections, you can go as fast as you like. What was really interesting to me was how it all seemed so safe. All of the drivers seemed to understand that they needed to stay in the right lane unless they were passing. There was one moment when a Porsche going at least 190 km per hour shot past me. That was kind of cool. As I got closer to the Swiss border, I began to worry about taking the chance of entering Switzerland without the international license. I pulled over and checked for camping sites in the Black Forest and then started heading west. I’m glad I did. I entered an evergreen forest through a rocky pass, and, as I drove on, I started seeing a lot more snow. When I reached Hinterzarten, I felt like I had found a winter wonder land. I was driving to Lake Titisee, which is about 10 minutes from there. Both areas are big tourist spots. Hinterzarten is more of a ski resort, and Lake Titisee is more of a summer resort. There were a lot of shops and restaurants and hotels in both spots. Martin Schubnell’s family owns Camping Bankenhof, which is located next to Lake Titisee. I finally reached Camping Bankenhof, a campsite that has sites for both campers as well as tents. 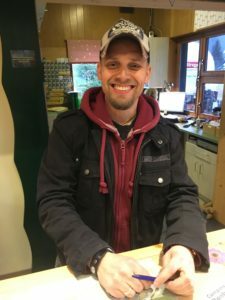 Martin, the owner’s son and future owner, told me that I could certainly stay there and invited me to look at the sites. He did tell me that I couldn’t light a fire because it’s forbidden here, just as wild camping is. I really liked Martin. He was local and very friendly and helpful, but, when I saw the tent sites buried in a half a foot of snow and realized that a fire was not a possibility, I decided to head on down the road to Lake Schluchsee. I considered just pulling out my sleeping bag and sleeping in the car for the night when I got to Schluchsee, but I decided I would check out some of the local lodging. Frankly, it was pretty cold. I found the Hotel Schiff, and I’m really glad I did. This place has a very old feel to it. The building itself has been here since 1562. It was a restaurant originally and even was a staff house for another hotel for a time. There is a room with a pool that looked like something out of the age of F. Scott Fitzgerald and a family room that looked like it was stuck in the 1950s. The elevator was tight and had a big metal down that swung out on its hinges. There’s an expansive restaurant and bar in the hotel, which looks out over Lake Schluchsee. I decided to eat there and to really go for an authentic German dining experience. I got it, but I also got another surprise as well. I met Sergio, my waiter. 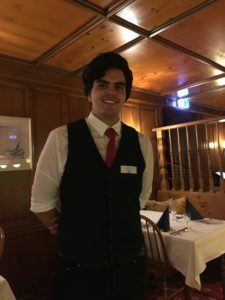 Sergio is working as a waiter at the Hotel Schiff to raise some extra cash before heading to university to study international business and politics. Sergio’s father is German and mother is from Guatemala, but he was born in the United States. He lived in Guatemala until he was 18 years old, and he’s working at the the Hotel Schiff to raise some money before he begins university in a few months. He plans to study international business and politics. I told Sergio that I wanted to eat some dishes that were quintessentially German, and he suggested Wildgoulash with hirsch (venison). It was served with a soft pasta and red cabbage. The venison was bathed in a brown sauce and was as tender as any I had eaten before. It was absolutely delicious. There was a couple eating at the next table. I didn’t get their names, but the man was from Houston, Texas. His girlfriend, who lives in Frankfurt, was fluent in German, English, and Spanish. It was really cool to watch Sergio talk with her. They kept switching between the three languages. Before checking out the next morning, I took a walk beside the lake. It was frozen and cold, but it was truly beautiful. I’m linking the video of the natural beauty of the Black Forest here. I didn’t plan on visiting this spot or meeting these people, but I’m really glad that I did.